Before the big game’s kickoff, the party will already be in full swing! Winnipeg is the host the 103rd Grey Cup, which comes with five days of events and activities. The Grey Cup Festival HQ is at the RBC Convention Centre, where visitors can roam the aisles of the CFL Hall of Fame exhibit, stock up on merchandise, and catch one of the three concerts that are part of the Manitoba Craft Beer Concert Series. Find our complete guide to the Grey Cup Festival here! This may come as a surprise, but Santa Claus is a huge fan of the CFL. That’s right, this year’s Santa Claus Parade is happening in conjunction with the Grey Cup Festival and it’s going to be bigger and better than ever. Santa Claus and company will wind their way through the streets of downtown Winnipeg, bringing all the action and an abundance of Christmas spirit. And just in case you still haven’t filled your Santa quote, check out these 10 Manitoba Santa Sightings that will certainly keep you on the nice list. Did you know that the Planetarium at the Manitoba Museum is one of the most advanced in the world? It was the first planetarium to use Digistar® 5, an all-dome digital projection technology that will transport you to places you’ve never been before – in 3D! Leave Earth and fly to the edge of the unknown universe in one seamless motion and take in the true perspective of our skies. Yeah, science! Current shows are Astronaut, narrated by Ewan McGregor, Live with the Stars and the zany Zula Patrol: Down to Earth. Christmas has come early to the Icelandic town of Gimli, and Santa Claus is leading the way! Friday’s festivities kick off with a community bonfire and caroling, followed by a parade, sleigh rides, tree lighting and a Christmas market. The fun continues on Saturday with a pancake breakfast, a skate with Santa and a scavenger hunt for the kids. Happy early Holidays! From the famous overture to the final glorious ensemble, Wolfgang Amadeus Mozart’s music in Figaro sparkles with intelligence and wit. Figaro, the former barber and now valet to the Count, is just hours away from wedding the lovely Susanna, a maid in the household. But alas, Susanna has caught the attention of the Count’s wandering eye. The day is soon turned upside down as clever twists and turns, disguises and comic intrigue ensue. You’ve never seen Alice quite like this. Draw out your inner child for an imaginative tale in this coming-of-age sequel to Alice in Wonderland. After travelling through the looking-glass, Alice meets with characters like Tweedledum, Tweedledee, Humpty Dumpty and the White Knight for a spectacular adventure of ridiculous, topsy-turvy fun. What, you mean you’ve never been to a concert of chipmunks? Well, now is your chance. Alvin and the Chipmunks along with the Chipettes are hitting the Burton Cummings’ stage for a squeaky live rock concert, covering hits by One Direction, Maroon 5, Carly Rae Jepsen, Elvis Presley and more! Encore, encore, encore! The first nativity scene goes back to 1223 in Italy, but you don’t have to travel that far to see over 100 different versions at the 3rd Annual Crèche Festival at the Allard Regional Library in St. Georges, 1.5 hours north east of Winnipeg. The festival features nativity scenes (or crèche in French) created by artists from at home and abroad, including many provided by Ten Thousand Villages, a Fair Trade store that sells goods from artisans in developing countries. From stained glass to intricate woodworking, these works of art are beautiful reminders of the hope and joy that fill the holiday season. This isn’t your typical rabbit out of a hat magic show. Britain’s Got Talent’s Simon Cowell said, “We are witnessing the birth of a star”, and now you can too. Master illusionist Darcy Oake will entrance and amaze in Winkler on November 23 as part of his Edge of Reality World Tour. After all the ‘oohs’ and ‘ahhs’ and ‘how did he do that’s are through, you will be left with a sense of awe and a new curiosity into the mysterious world of illusion. The good old hockey game brings the roar to the crowd when the Winnipeg Jets take on the Colorado Avalanche on November 23 and 28, the Washington Capitals on November 25, the Minnesota Wild on the 27th. As always, tickets are limited, so grab what you can before they’re all gobbled up. And there’s plenty of pre- and post-game action at surrounding pubs, clubs and eateries like The Pint, Shark Club,The Met, and Tavern United. Who is the Butcher? 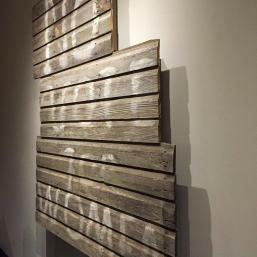 On Christmas Eve, at a police station, a mysterious old man is found wearing a foreign military uniform and a Santa hat, with a meat hook dangling around his neck and a note saying “Arrest me.” As a lawyer, a police officer, and a translator struggle to unravel the truth, they uncover a past that won’t stay buried, and a decades-old quest for justice that must be served. Haunted by events a world away, no one is who they seem to be. The holiday season hasn’t officially started in Altona until the lights have been lit and the town has gathered for their annual Night of Lights Parade. After the parade, join in for all the festivities including caroling, roasting wieners over a roaring bonfire, and savouring a cup of hot chocolate with neighbours and friends. On January 28, 1916, the Manitoba Legislature amended the Manitoba Election Act and for the first time in Manitoba’s history, some (but not all) women could vote in provincial elections. 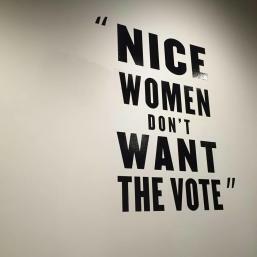 With the 100th anniversary of this event, the Manitoba Museum’s brand new exhibit, “Nice Women Don’t Want the Vote,” outlines the causes, contradictions and people involved. 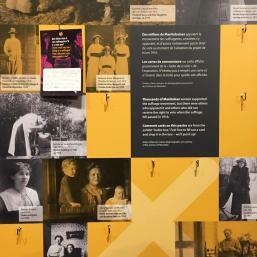 Don’t miss this unique glimpse into the suffragist movement! What was your favourite childhood fairy tale? If you enjoyed classics like Cinderella, Humpty Dumpty and Three Blind Mice, you will be delighted and charmed by the Children’s Museum’s favourite holiday exhibit. The last original Eaton’s Fairytale Vignette Display from the ninth floor annex of Eaton’s downtown store is now fully restored and open to the public, for a limited time only! Told with wit, wisdom and an open heart, Wiesenthal is the compelling true story of an ordinary man who devoted his life to one extraordinary mission. After surviving the Holocaust with his family destroyed but his humanity intact, Simon Wiesenthal spent 58 years tracking Nazi war criminals, bringing more than 1,100 to justice. His mission came at a personal cost but as a survivor, he was committed to planting the seeds of a better future in honour of those left behind.